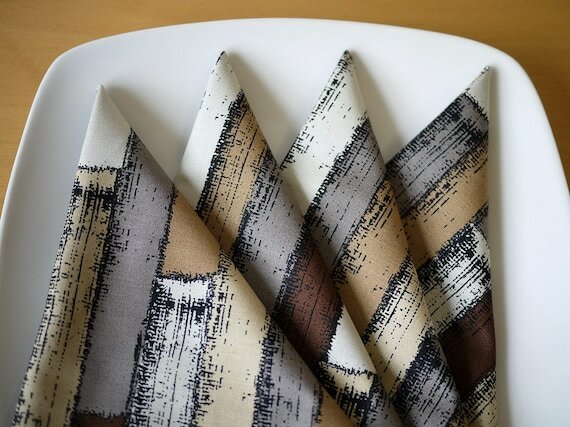 Bold and energetic, the print on these napkins was inspired by patterns in quartz and are from my own Mineral Forest Collection of fabrics. 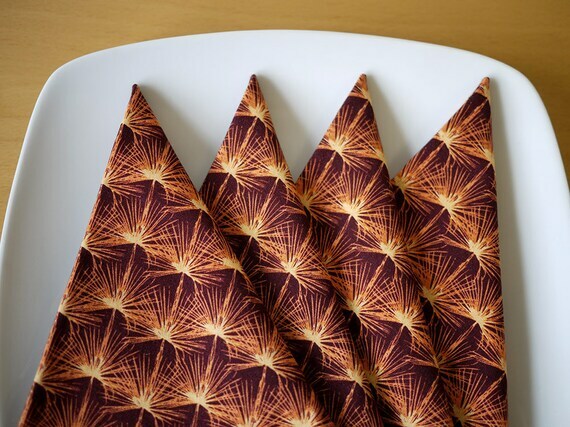 Great for wedding gifts, housewarming gifts, hostess gifts, Mother's Day gifts, and holiday gifts!DETAILS: - This listing is for a SET OF FOUR cloth napkins - Each napkin measures 19" x 19" - Machine washable - cold or warm, steam iron okay. - Coordinates with blue Fracture Print Reversible Placemats - see listing: https://www.etsy.com/listing/182096788/reversible-cloth-placemats-fracture?ref=listing-shop-header-0**Fabric prints come in more than one color combination and can be custom ordered if you would like an alternate color. Contact me to discuss your options. Need more than 4? Just ask.Thanks for shopping Lori Mason Design! Original organic pine print in Fall colors - perfect for a Thanksgiving or holiday table setting.All fabric prints are my own designs from the Woodland Collection, printed by RJR Fabrics.19" x 19" with a 1/4" hem on all 4 sidesSet of 4Machine washable, cold or warm, steam iron okay*Fabric prints come in more than one color combination and can be custom ordered if you would like an alternate color. Contact me to discuss your options. Need more than 4? Just ask.Thanks for shopping Lori Mason Design! 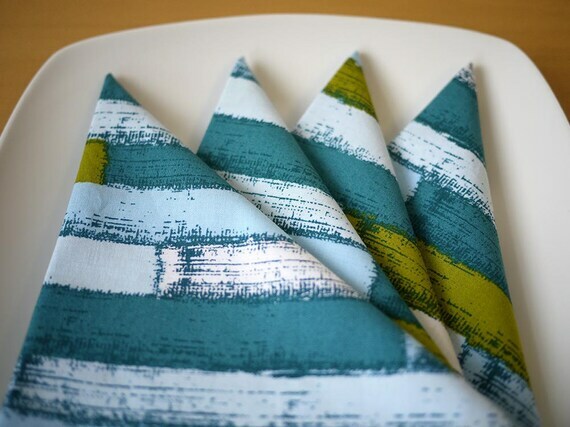 A new take on a wiggly stripe, these napkins are an energetic addition to your table.All fabric prints are my own designs from the Reverie Collection, printed by Andover Fabrics.19" x 19" with a 1/4" hem on all 4 sidesSet of 4Machine washable, cold or warm, steam iron okay*Fabric prints come in more than one color combination and can be custom ordered if you would like an alternate color. Contact me to discuss your options. Need more than 4? Just ask.Thanks for shopping Lori Mason Design! The prints in this collection were inspired by the patterns in rocks and minerals and are from my own Mineral Forest Collection of fabrics. 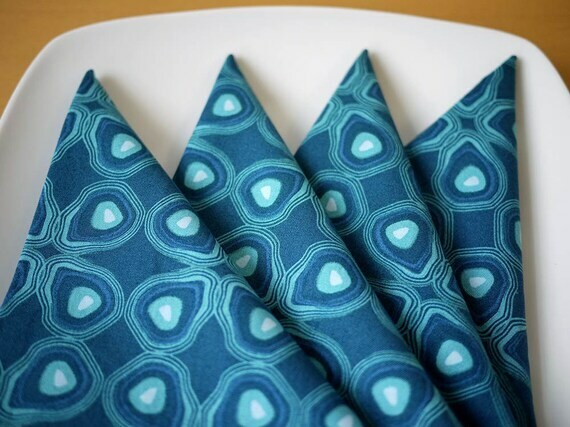 Great for wedding gifts, housewarming gifts, hostess gifts, Mother's Day gifts, and holiday gifts!DETAILS: - This listing is for a SET OF FOUR cloth napkins - Each napkin measures 19" x 19" - Machine washable - cold or warm, steam iron okay. **Fabric prints come in more than one color combination and can be custom ordered if you would like an alternate color. Contact me to discuss your options. Need more than 4? Just ask.Thanks for shopping Lori Mason Design! 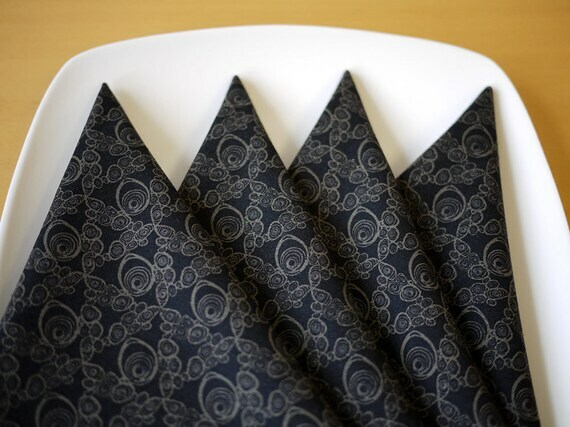 Put some curlicue patterning on your table with these mod Rhapsody Print napkins!All fabric prints are my own designs from the Reverie Collection, printed by Andover Fabrics.19" x 19" with a 1/4" hem on all 4 sidesSet of 4Machine washable, cold or warm, steam iron okay*Fabric prints come in more than one color combination and can be custom ordered if you would like an alternate color. Contact me to discuss your options. Need more than 4? Just ask.Thanks for shopping Lori Mason Design! 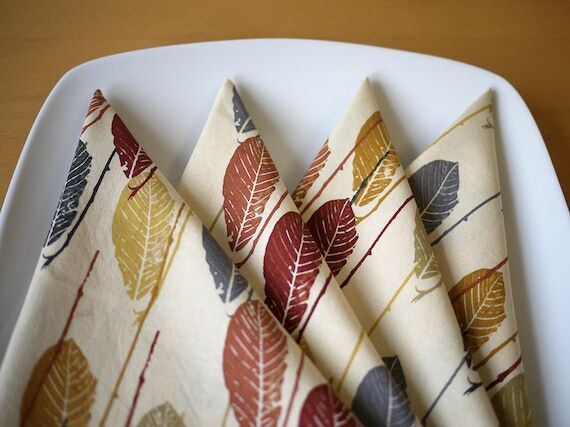 Original organic leaf print in Fall colors - perfect for a Thanksgiving or holiday table setting.All fabric prints are my own designs from the Reverie Collection, printed by Andover Fabrics.19" x 19" with a 1/4" hem on all 4 sidesSet of 4Machine washable, cold or warm, steam iron okay*Fabric prints come in more than one color combination and can be custom ordered if you would like an alternate color. Contact me to discuss your options. Need more than 4? Just ask.Thanks for shopping Lori Mason Design! The prints in this collection were inspired by the patterns in rocks and minerals and are from my own Mineral Forest Collection of fabrics. 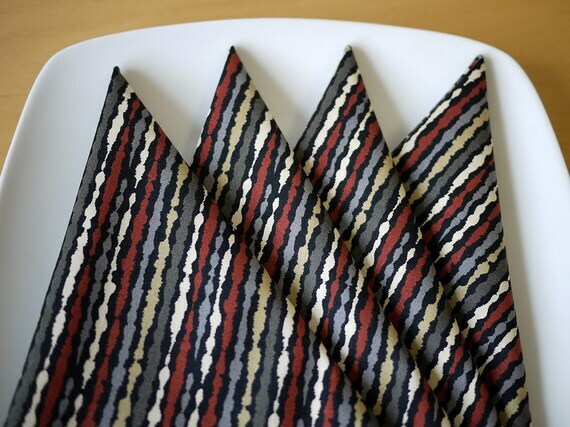 Great for wedding gifts, housewarming gifts, hostess gifts, Mother's Day gifts, and holiday gifts!DETAILS: - This listing is for a SET OF FOUR cloth napkins - Each napkin measures 19" x 19" - Machine washable - cold or warm, steam iron okay. - Coordinates with Petrified Print Reversible Placemats - see listing: https://www.etsy.com/listing/182109447/reversible-cloth-placemats-petrified?ref=listing-shop-header-0**Fabric prints come in more than one color combination and can be custom ordered if you would like an alternate color. Contact me to discuss your options. Need more than 4? Just ask.Thanks for shopping Lori Mason Design!